Hello Loves! I have 10 new colors to show you from the Madam Glam Gel Polish line. There's something for everyone in this group! 5 new full coverage glitters, one glitter/frost, one simple cream, and three fabulous brights. Want to see them? Let's start with the brights. #004 Bittersweet is a gorgeous, medium pink cream that leans to the bright side. Application is dreamy and smooth as I have come to expect from Madam Glam creams. This is two perfect coats. Ready to go a little brighter? #431 So Hot! is an almost neon coral cream. It is much brighter in person than it appears in my photos. This one is nearly impossible to capture and would look awesome with a summer tan. It also offers perfect coverage in two easy coats. Brighter still? Ok, fine. #332 Neon Yellow is a super bright and intense highlighter yellow cream. This one does have a little bit of vnl in two coats, but would likely be opaque in three. I found application to be a breeze, which is almost unheard of for yellows! Let's bring it back down. #425 Angel Wings is a super soft, pastel, baby pink cream. This is a shade that tends to be difficult to apply as well, but Madam Glam did not disappoint. This is two simple, streak free coats. Have I mentioned how much I love the Madam Glam formula?!?!? Keeping with the pinks, #418 Soft Romance is a frosty, dusty light pink with a scattering of holographic silver glitter. I admit, I love the idea of this polish...in theory. In application, I'm not a fan. The frosty finish doesn't work as well with the glitter as I would have hoped. Instead of having that subtle sparkle, it ends up looking lumpy to me. I actually swatched this one twice as the first time the glitter bunched up on me from stroking over it too much. Coverage is perfect with two coats and the color is fabulous, but I'm just not a fan of the finish. With that said, I'm sure others will love it! The next glitter in this lineup is #144 Yellow Holo. I don't know that I would call it yellow...I think gold is more appropriate. This clear base is loaded with holographic gold micro glitter that offers full coverage in two easy coats. Speaking of gold, #126 Golden Queen is a beautiful, champagne gold glitter in a clear base. It almost looks silver...so much so that I had to look at it in different lighting to be sure it is gold. Like Yellow Holo, she offers flawless full coverage in just two coats. I should also note that with these last three swatches, the glitter glides on easily with little to no bunching. If you've used a lot of glitter polishes, you know how impressive that is! Next up is #74 Hypnotize Me. This red jelly base is loaded with red micro flakes. The result is a stunning glittery finish that is guaranteed to grab attention. The micro flakes do make this one a little difficult to apply compared to the other Madam Glam glitters. I found the polish to be almost chunky when pulling the brush out of the bottle. Once I wiped both sides of the brush on the neck of the bottle, the struggle was pretty much over. Application was a tad tricky around the cuticle line due to the irregular shape of the flakes, but the rest was a breeze. She's opaque in two coats. Finally, my absolute favorite of this group is #071 Purple Sky. This deep purple base is loaded with red toned purple glitter. It applies flawlessly like the majority of the Madam Glam glitters mentioned here and offers exceptional coverage in two coats. The glitter is slightly more red toned than it appears in my pictures here (on my monitor, at least), but only slightly. Isn't she gorgeous!?!?! If any of these colors need to find themselves in your collection, you can pick them up from Madam Glam's website here (or click the link for the polish name...it will take you right to that listing). 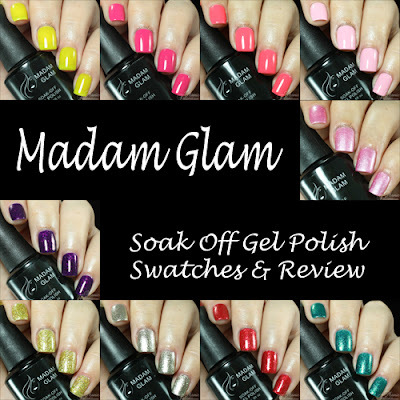 *The Madam Glam Gel Polishes featured in this post were provided by Madam Glam for my honest review. 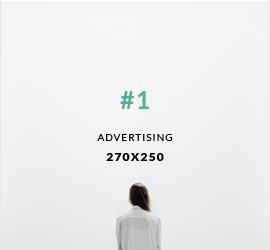 All links within this post are courtesy links and do not benefit Manic Talons.com. Daaaaang! MG knows how to make some gel polish! 2 coats for most? and those glitters?? My favorite glitters out of my gels are MG. Gelish needs to take note! You can also sign up for their subscription program which gives you $80 in store credit per month for just $39.95. (You can unsubscribe at any time) It's called "Make Up Dazzle. I did this... so for 39.95 I get 4 polishes a month with free shipping - which is less than I was spending on Gelish! I am loving the Chameleon polishes, which are just so much fun. I tend to get a little bored with wearing the same color for 10+ days, but with the color changing polishes I am never bored, because I never know from one moment to the next what my polish will look like!! Thank you for all these swatches! Its nice to know exactly what you are going to get when you order online. Thank you Michelle for the kind words and fair observations!